Resources For Your Next Project! WHAT ARE THE STANDARD SIZES FOR YOUR LASER CUT METAL PANELS AND DECORATIVE METAL SCREENS? There are no standard sizes. We fabricate to your installation requirements. The only size constraint is during fabrication. The maximum single panel size is 58”x 118”. However, if needed, the panels/patterns can be matched to provide a continuous look across a larger area. WHAT TYPES OF PROJECTS WOULD I USE YOUR LASER CUT METAL PANELS AND DECORATIVE METAL SCREENS FOR? We supply panels for room dividers, shade curtains, wall hangings, suspended ceilings, balustrade infill, and other interior and exterior applications. Our specialty is pattern design coupled with laser cutting. I NEED MORE THAN PANELS AND WOULD LIKE TO USE ONE SUPPLIER. CAN YOU HELP? We are a complete metalworking shop and can help with any of your metal fabrication needs. We do custom metal fabrications for shelving, bar tops, bracketries, entrance screens and much more. Contact us to learn how we can help with your next project. We can ship anywhere in the United States. We have excellent negotiated freight rates that remove the barriers of high shipping costs. 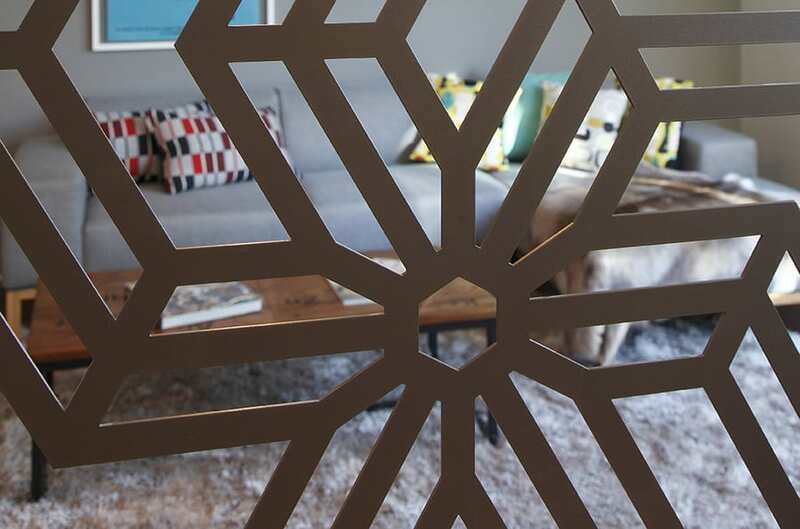 ARE YOUR LASER CUT METAL PANELS AND DECORATIVE METAL SCREENS BETTER FOR INTERIOR OR EXTERIOR APPLICATIONS? Our panels are painted with architectural polyester powders that are excellent for both interior and exterior applications. 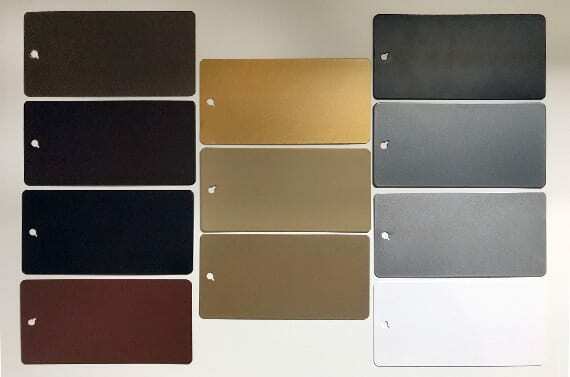 We have a wide variety of architectural colors—bronze, gold, silver, copper, pewter and quartz shades—and can send you sample paint colors if needed. Just contact us. WHAT MATERIALS DO YOU USE FOR YOUR PANELS? Most of our projects are done using 1/8” powder coated aluminum but we can do other metal materials as needed. WHY STRUCTURAL ALUMINUM VS. ANOTHER MATERIAL LIKE MDF? Aluminum is corrosion resistant. Even if the paint gets chipped, it won’t rust. It is also light weight (1.2 lbs. per square foot after fabrication on 1/8” thickness) and rigid. With aluminum, you can also do precision laser cutting which creates crisp, high-quality and intricate designs. Comparatively, MDF needs to be thicker and it burns. It can wear, get nicked and damaged more easily. It is also heavier. At 3.2 lbs. per square foot on ¾” thickness, it is twice as heavy as aluminum which will add to the cost of shipping. DO YOU HAVE A FRAMING SYSTEM FOR THE PANELS FOR INDIVIDUAL APPLICATIONS LIKE PRIVACY SCREENS? Our panels can be framed in low profile aluminum extrusion. We will work with your contractor or carpenter to assist in suggestions for installation. CAN YOU HELP ME IF I ALREADY HAVE MY OWN CUSTOM DESIGN? Yes, if you have your own design, we can consult with you on the best way to produce and fabricate it. WHAT COLORS AND DESIGNS ARE AVAILABLE? We use standard architectural metallic paints in a variety of bronze, gold, silver, pewter and quartz shades. We have about 50 designs that you can view on our website in the designs section. We also have another 150 unpublished designs we can share with you for budgeted projects. You can see over 200 of our client installations on our Pinterest board. Contact us for design and paint samples. Standard materials used on most of our projects are aluminum and steel. Standard thickness we offer is 1/8”, but we can also use thinner or thicker material, and other material types including corten steel, stainless steel, copper or brass upon request. 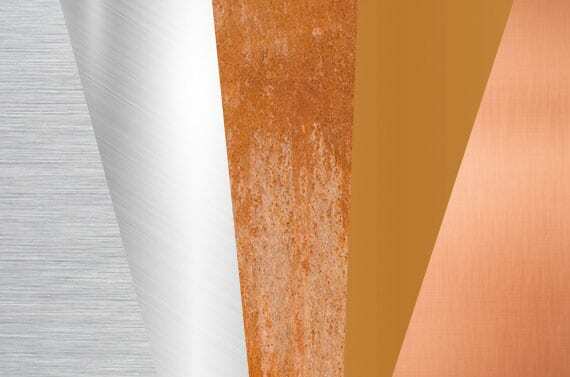 GTM Artisan Metal panels are available in a variety of standard, architectural grade, polyester based powder-coated colors (bronzes, golds, silver, copper, pewter and quartz shades), that are excellent for both interior and exterior applications. There are no standard sizes; our projects are custom and made to order. We fabricate panels to your project requirements and sizes for your application, and design to provide a continuous flow of the pattern throughout the installation.